This is the website for Hempfield Church of the Brethren (HCOB). 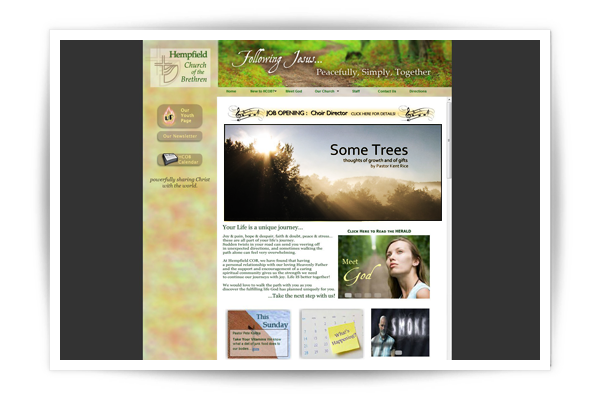 While I did not initially design this site, I did implement the design, and it has served well for many years. I have maintained and developed the site (and a collection of sub-sites) since its initial launch on Mother’s Day 2009. The Hempfield Church of the Brethren has a high commitment to their web presence and realizes the potential that a good website holds for the Kingdom’s sake. The church has demonstrated their commitment by appointing a team to regularly meet with me. The team and I pray, dream and innovate together. Hempfield COB realizes that in ministry the primary stewardship question is not “How much is this going to cost?” but “Who is this going to reach?” The leadership of Hempfield Church of the Brethren haven’t buried their talent; they have put it to work for them, and by God’s grace it has paid dividends. Primarily invite and welcome the unchurched to meet and develop a relationship with our great God! We increasingly hear from visitors that it was the website that brought them to our church. We have been blessed to see God use our website to bring people to our church-some to visit with us for a time, some to become members of our church family. We increasingly hear from visitors that it was the website that sparked their interest in our church. We have been blessed to see God use our website to remind us what it means to be part of the family of faith. We have been blessed to see God use our website to restore broken families separated by decades of silence and a distance of 48 states. 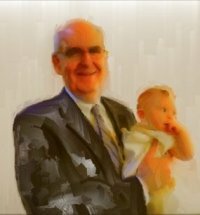 We have been blessed to see God use our website to help us remember and grieve together those who have already gone home to God, even our dear Pastor John Layman. We have been blessed to see God use our website to facilitate the launch of ministries like the East Petersburg Faith Outreach that will carry the transforming power of the Gospel to our community and beyond. 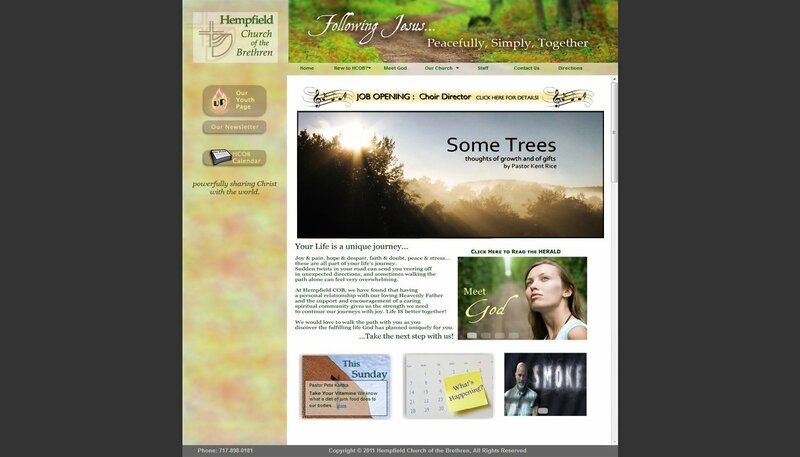 The Hempfield Church of the Brethren website has been a labor of love, a showcase of God’s goodness and grace to us. We have stretched the website’s current framework almost to its farthest extents. We are currently exploring a complete redesign of our website that will increase our agility and open up even greater ministry possibilities. Throughout my description of the HCOB website, you will notice that I make frequent use of the 1st person plural (i.e. “We have been blessed to see God…” or “We are currently exploring…”). This might be confusing. I am not a member of Hempfield Church of the Brethren but I am part of a team at HCOB and we are all members of THE CHURCH. The people of HCOB are very gracious and have made it easy to experience the feeling of family and depth of relationship that our Lord prayed would characterize us. We have a bond in Christ which transcends our philosophies of ministry (as it should). I do many things for HCOB. I have made their brochure and maintained and developed their website. I consult with them on technical issues and function as their in-house IT person. I have done everything from virus removal to setting up their networks and purchasing their laptops. I do not do everything, however. While most of the website is my responsibility, I do not create all of the content that is placed on the site. The sermon graphics are created by HCOB staff, for example. 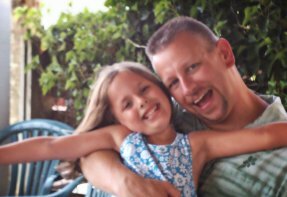 Occasionally the pastors will use their own images for their blog entries. Some flyers and brochures are made by their staff or volunteers. If you have any question as to which work is my own, please do not hesitate to ask.